With loop mania sweeping the globe, BOSS proudly announces the most powerful Loop Station ever brought to the market the RC-300. The new flagship looper features three synchronized stereo tracks with dedicated volume knobs and transport-control footswitches for each track. 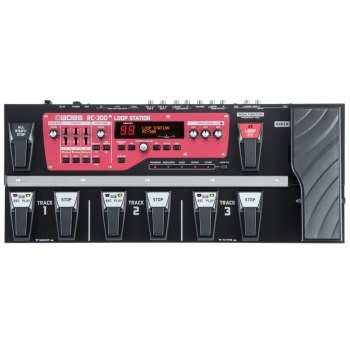 It’s also equipped with pro effects, a master Expression pedal, and a deluxe, ultra-wide control panel for the ultimate in live-performance manipulation. Plug in your guitar, bass, keyboard, or instrument of choice and create amazing loops in real time. An XLR input is also provided, complete with phantom power, so singers, percussionists, violinists, beatboxers, or anyone with a mic’d instrument can get in on the act, too. The RC-300 lets you record for up to three hours directly to its internal memory, adding effects as you go. The USB port lets you save your loops externally, as well as import/export WAV files. Step into the most powerful and inspiring Loop Station in BOSS history. It’s the creative powerhouse that musicians have been dreaming of!